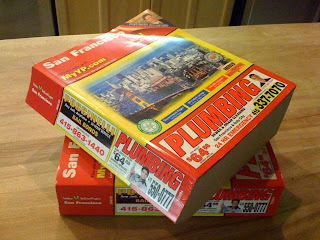 Today I received 2 huge phone books (we have a few phone lines at the address) and they aren't even the "official" phone books. YIKES! What a waste of paper and energy to give these out. I don't know anyone who wants them (especially since they are not even the ones that the phone company provides). I know many people who don't even use those anymore since you can look up everything online. It is particularly telling that they even printed on the cover of this edition, "100 percent recyclable." No kidding. I learned via Enviromom about a way to opt-out of receiving the phone book. I plan to call the companies that produce the book and ask to be removed from their lists. In addition, you can sign a petition (there's a petition for everything, isn't there?) asking companies to stop printing the huge books. I don't know that they will, as selling the ads gernerates literally billions of dollars. Worth a try, though. Did you know the yellow pages industry produced 540 million books last year? Maybe if the advertisers know that no one is looking in the books, they'll stop buying the ad space. Maybe then they'll stop printing them. Great post - thanks for the information. I will definitely be opting out of the phone book - I guess there are people who still use them, huh? Consumers can now “opt out” of receiving telephone books at www.YellowPagesGoesGreen.org. This organization will contact the publishers and inform them to stop delivering books. This is a free service for consumers. www.YellowPagesGoesGreen.org is working with state and local governments on ordinances concerning the delivery of unsolicited telephone books. www.YellowPagesGoesGreen.org is not against the telephone books but against the delivery of 4 to 5 pounds of paper on people’s door step 5 to 6 times per year and being told it is our responsibility to recycle something we did not ask for. If we need a book we will call. Otherwise I “opt out” from receiving it. Here are phone numbers of the publishers if you would like to call them instead: The directory publishers listed make it possible for you to stop receiving their books, but they don’t make it easy. None of the menu options includes “opting-out”. Follow the roadmap and you should get to a customer service representative who can help you. I have good news on this I used the services of this is myjunktree and was able to stop the delivery of the phone books to my home. It was fast and easy. They also stopped all the credit card offers, and catalogs i no longer wanted. I always took the phone books straight to the recycling bin with the rest of my junk mail. I don't recycle as much stuff anymore, but I stopped it before it gets to me and I think that is even better. Thank you, Mom Go Green, and all commenters... I found this blog yesterday after yet three (3) more phone books were delivered to my house. I signed up at yellowpagesgoesgreen.org, and I sure hope it works. I moved from Chicago to Nashville, TN five years ago, and I'll tell y'all, I've never SEEN so many phone books in my life. We get 2 delivered in January, 3 more in July and 2 more in October! Seven (7) phone books per year! In Chicago, you'd get 3 phone books per year... if I recall correctly. And the Chicago metro area is between 7 and 8 million people, whereas Nashville metro is 1 million. It's absolute wasteful insanity.